John Cryer has lobbied the Home Secretary and arranged a further ministerial meeting in his fight to save Waltham Forest's anti-gangs strategy, which is facing a financial shortfall. John Cryer MP is working with council leader Chris Robbins to try to secure more funding for the strategy. "I spoke to the Home Secretary during the riots and pointed out that we desperately need more funding. The strategy seems to be getting results and I don't want to see it end due to funding, or lack of it. "The Home Secretary has arranged for Chris Robbins and I to meet Angela Browning, who is the Home Office minister in charge of finance. That will be happening in early October." "We need to promote the anti gangs strategy which has had positive tangible outcomes. This is not the time to jeopardise all the good work that has gone into helping tackle gangs in our local area. The Government, local authorities and other key agencies need to be on the front line against gang related crime." 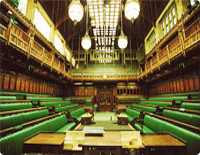 John Cryer questioned Prime Minister David Cameron today at the emergency House of Commons debate on the England Riots. "It took 2 days of violence before the police committed extra police numbers in our streets and communities. I told the Prime Minister I have not been convinced with the explanations put forward so far about the delay in providing these extra resources to tackle the rioters." "What happened with the 4 day of riots was intimidation and theft - that is pretty clear. The attacks were on businesses which carry high-value goods so we can see what the intent was. This is just unacceptable." "The perpetrators must be dealt with in a very determined manner by the criminal justice system." In a telephone discussion with the Home Secretary, Theresa May MP, John also raised concerns about the potential cut in Police numbers in London and the need for more resource in tackling gangs locally. Leyton and Wanstead MP, John Cryer has visited a number of local businesses in the aftermath of the looting which has affected parts of Waltham Forest. "What happened here was intimidation and theft - that is pretty clear. The attacks were on businesses which carry high-value goods so we can see what the intent was. This is just unacceptable." "There were legitimate and genuine concerns over the unexplained death of Mark Duggan in Tottenham and the original protest was peaceful. But subsequently criminal elements have hijacked the situation for their own ends. The government has looked pretty close to losing control of the situation and this is before cuts in police numbers have really started to hit home." "However, we have seen the abolition of the Education Maintenance Allowance and rocketing youth unemployment. Those two factors have disproportionately affected Waltham Forest and it is a situation that is unsustainable."